An irresistible game for you and your spouse! 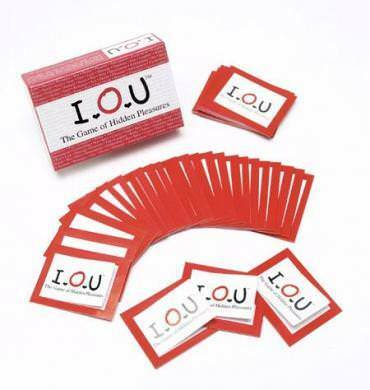 With I.O.U., you will discover inventive ways to heat up the passion and anticipation in your relationship, learn new bedroom tricks, and variations on the old ones. There are 42 hidden pleasure pull-tab cards. I’m super timid when it comes to the intimate part of things, but I’m also very competitive and my husband knows this. I won’t back down from a challenge! These are a great way for me to initiate things for a change. I slip one in his wallet and tell him once he’s at work, and then I find out later what I actually owe him. He loves it and it’s pushing me to be more available for him!